Go to the RITZ YouTube Channel to see more videos. Go HERE to see two video clips from the Riding in the Zone DVD. Newly opened Palmer Motorsports Park was carved into a mountain at the cost of big buck$. The result is an epic track with crazy elevation changes. Runoff could be better, but is fine for track days. Here is Ken being chased by fast guy, Paul Duval. Here’s a selfie of Ken riding the Palmer track. Notice techniques like clutchless upshifting, trailbraking, smooth brake to throttle transitions, body positioning and early head turns. Ken narrates a few laps of Thompson (CT) road course during a advanced group session. Ken rides the 2015 BMW S1000RR during the press launch. Here is a video of Ken riding a 2005 ZX6R at New Hampshire Motor Speedway. With embedded data. I want to point out that the video shows me occasionally braking in areas where I don’t typically brake. I’m not going fast enough in the video to need to brake before turns 10 or 2, or 12a. I was experimenting with getting the bike to tip in a bit easier by loading the front tire. I discovered that it really wasn’t gaining me enough to do, so I stopped doing it. A couple of other times I braked in odd places because someone was in front of me. I’ll also point out that the long-duration braking is typical of track day riding where I’m not trying to keep competitors at bay. Instead, I’m taking the time to load the front tire gradually. You can see that the brake force never spikes and doesn’t even go very high. That would be different if I were racing. The brakes would be used more forcefully and for less time. I would also be on the gas earlier and harder. This video is the same as the one above, except I added some educational annotations. Riding the Street Triple at the New York Safety Track in the uptown direction behind fellow instructor, Paul Duval. A session with some of the fast group riders during the 2014 Tony’s Track Days “Mancation”. Riding the 05 ZX6R on the Thunderbolt racetrack at NJMP. Riding a 250 Ninja on the Thunderbolt track. Below is a video that Aaron (Aprilia RSV4) shot of my first few warm up laps during a chilly weekend at Barber Motorsports Park in Alabama. The video does not show just how much of a roller coaster this track is. The elevation changes are significant. The Museum turn where we ride over the curbing is a less extreme version of the corkscrew at Laguna Seca. More Barber videos with the Triumph Street Triple R can be found HERE. Ken rides the Hatfield McCoy Rock House trail system (WV) with Tony From Tony’s Track days during Mancation 2014. In case you were wondering why Ken is talking so much, he and Tony are using Interphone brand Bluetooth communicators. I have to say I am not impressed with some of these videos. A lot of the people look very crossed up. Not sure exactly which videos you’re referring to, but this is a common result of riders who don’t quite get it right. That said, being a bit crossed up isn’t the end of the world, either, unless it’s to the extreme. Hi! I’m no novice and although I consider myself to be a great rider, I’ve yet to ride on a real track. I’ve had 3 Connie C10’s, a Yamaha FZ6 and most recently a BMW K1300S. $29.95: A Great Gift Idea! 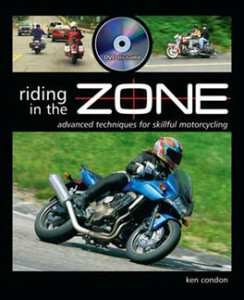 Includes a 30 minute DVD with parking lot drills to advance your riding ability. 143 pages. Full color. Get your autographed copy today! Ken wears Macna Riding Gear! Support RITZ & the AMA: Renew or Sign up HERE! 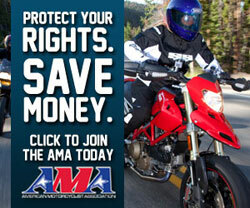 The American Motorcyclist Association advocates for Motorcyclist's Rights. Please support them (and RITZ) by becoming a member! Just click the image above to renew your membership or to become a member!